So when and why did Mount View Estate become the Chewton Bushlands? A curious thing me thinks. Does anybody have any ideas? Cate found the sign above and she will soon be on the trail I am sure. I will continue to hunt for hard evidence in the People and Places information etc. According to Bill Cassidy who I spoke to on Dec. 19, 2012, the name Mount View Estate was introduced as it sounded more classy than the simpler one of The Chewton Bushlands. Cassidy Real Estate had spent quite a lot of money on the Age advertisement put out earlier. It had carried that more modest heading, and it had not drummed up much business. Of the nine stone houses that Brian Parsons (pictured below) was responsible for building, the one on Lookout Ridge was the last. It is the one closest to Mount View Road and it has a panoramic view: a glorious vista out and over towards Mount Alexander. This is also the house that is pictured in the amateurish advertising board that was once on display at the offices of Cassidy Real Estate in Castlemaine. 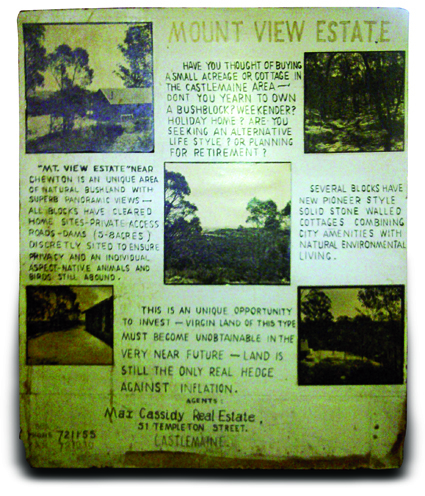 The name Mount View was inspired by just that, and came after that of The Chewton Bushlands, but as Bill Cassidy said, it didn’t make that much difference as sales remained sluggish until the early 80’s. I think most would agree that The Chewton Bushlands suits us much better so it’s a good thing that that’s the one that lasted. BUT…. Out of all this stems another puzzle. Just who named our roads and when? Why call it Mount View Estate when the house is on Lookout Ridge not Mount View, and who thought of Dishpan, Miners Hut, Goldspeck Gully and so on? Sparks is an obvious one and I believe Commissioners goes back a way but what of the others? Was it some clever person at the Council or is there more to it than that? Time for a bit more sleuthing! This entry was posted	on Friday, September 21st, 2012 at 4:40 am	and filed under • Bushlands history. You can follow any responses to this entry through the RSS 2.0 feed. Much of the info. recorded here is INCORRECT! 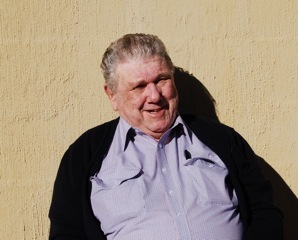 Brian actually built three houses up and around Mount View Road… On lots 27, 39 and we think Lot 29. Cate’s assessment of 6 only houses is WRONG! 8 or 9 is the correct total. AND, as to the naming of the roads, Brian named all but those that came in later such as Bush Sanctuary for example. Dishpan Gully, Miners Hut, Old Settlers, and Goldspeck Gully Roads were all named by Brian as he went along. He saw such names as being picturesque and he was right about that! Regarding the naming of Mount View Estate. We were right about that happening later, AFTER the naming of the Chewton Bushlands Estate. Brian saw them as being almost separate and they were advertised at different times. Mount View only happening in the mid to late 70’s.